The Broadcast Television Journalists Association (BTJA) today announced nominations for the 3rd annual Critics’ Choice Television Awards, which will be held the evening of Monday, June 10, 2013 at The Beverly Hilton Hotel. For the first time the award show will be webcast live on UStream at: http://www.ustream.tv/channel/critics-choice-television-awards. Fan favorite actress and stand-up comedian Retta, currently appearing as Donna Meagle on Parks and Recreation, will host. She has appeared in numerous films and television shows, and has performed on Comedy Central’s Premium Blend. Submissions are still being accepted for The Most Exciting New Series category, which will be announced on Monday, June 3. Nominated programs and performances aired between June 1, 2012 and May 31, 2013. 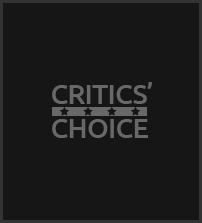 Bob Bain will executive produce the Critics’ Choice Television Awards for Bob Bain Productions.